As much as I hate to say it, Summer is winding down. Personally I cannot wait for Autumn and the colder months, pumpkin spiced lattes, crunchy leaves on the floor - it's my favourite time of year. When I was contacted by BKLYN to try one of their Fur Pom Pom Hats, I knew it was going to be the perfect transitioning piece for my wardrobe, that will see me right through until winter. The hats come in a wide range of colours with plenty of options to mix and match so you are bound to find something that suits your style. The fur pom pom is even detachable so you can buy multiple hats in many colours and switch them about. I received my hat in navy, white and purple. The Fur Pom Pom Hat cost £55 and come packaged nicely in a protective sleeve box. The quality of the hat is outstanding and definitely worth the price tag. The hats are made using the finest Italian merino wool and is the softest hat I have ever owned. The natural fibres of the material mean that the hat is also gently on your hair and skin. I feel really comfortable wearing the hat and it doesn't irritate my head in the slightest. 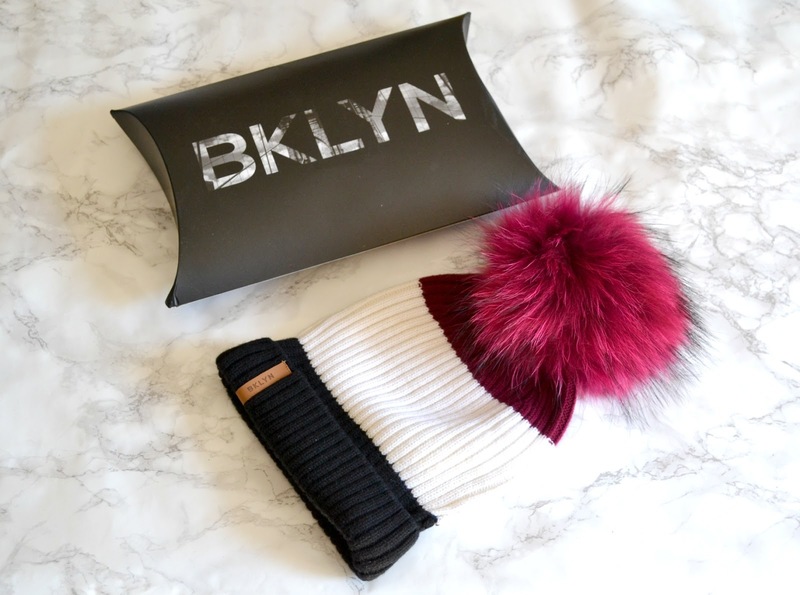 Head over to the BKLYN website to get your own Fur Pom Pom Hat. What colour would you choose?